"Orcas Island pottery is a growing, living thing. It's like a river, you can't step into it in the same place twice." In 1945, Joe and Marclay Sherman opened Orcas Island Pottery. This simple act was the beginning of building the reputation of Orcas Island as a “pottery island”. They dug clay from the banks and created a studio and store that visitors to the island came to know as an island institution. They traded a local farmer a set of 4 plates and 4 bowls for the now 150 year old trappers log cabin of old growth fir, dismantled and moved to the property, to become the showroom that it still is today. 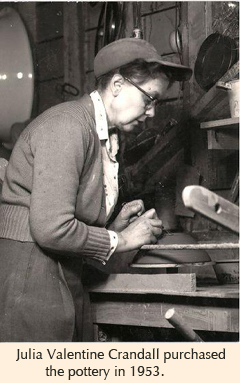 Julia Crandall bought the pottery from the Shermans in 1953. A school librarian in the winter, Julia and her daughter, Trudy Erwin, learned from the Shermans what they knew and went on to develop their own artistry for the summers of the next several decades. Julia made pottery until the late 1970’s and Trudy ran her own pottery shop first in Berkeley, and then just down West Beach from OIP, at The Right Place, until the age of 89. Trudy’s daughter, Syd Exton, became the manager and lead potter of OIP in 1989 and inherited the pottery from her grandmother in 1993. 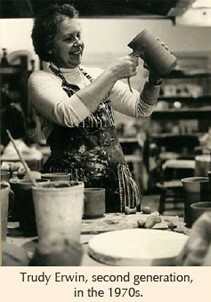 Syd had spent her childhood summers at the pottery and thrown her first pot when she was 5 years old. Her knowledge of the techniques and skills necessary to create beautiful, functional pottery was absorbed from her mother and grandmother and the countless guest potters that passed through Orcas Island Pottery over the years. Knowledge passed from grandmother and mother to daughter (and eventually on to her children)–this is one of the most significant unique features of the OIP story. Through the years many extremely talented potters have worked at the Orcas Island Pottery, ceramic students have found their artistic voices, self-taught potters have developed their craft. The pottery has been training ground as well as more permanent home for over 30 potters over the years. Julia and Trudy not only made pottery, they created a magical environment for the visitor to enjoy. Much of the pottery was, and is, displayed outdoors, there has always been a swing for the kids, and the view from high-bank waterfront across President’s Channel, to Waldron Island and beyond, is breathtaking. Syd has taken this enchanted place to it’s next level. She has enlarged and developed the beautiful gardens, and added a fanciful treehouse that invites visitors to climb into the upper reaches of a 200 year old cedar tree. She has continued to gather a group of potters and work that grows finer with each passing year.